A unique perspective is added to your holiday by including a great train journey into your travel itinerary – train travel is truly in a confederacy of its own. Trains transport you in style from one amazing place to another, and give you the freedom to do nothing but relax and adore the ride. When taking a train safari through southern Africa, you choose the level of luxury and type of great train journeys that suits you. You simply do nothing more but enjoy an unforgettable African train safari. Explore various countries in southern Africa and encounter a range of fascinating cities, white beaches, captivating game parks, ancient sights and picturesque splendours. South Africa’s Rovos Railway and Blue Train are ranked among the top 25 rail tours in the world. 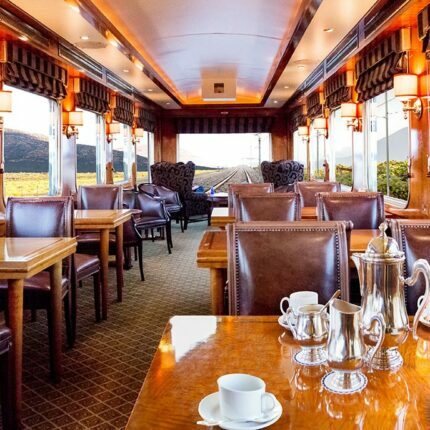 The Society of International Railway Travellers has ranked South Africa’s Blue Train and Rovos Railway among some international heavyweights in luxury rail, including the Prestige Continental Express in Europe, and the Orient Express of Asia.